Whisk together the eggs and milk, and then whisk in the dry ingredients. It should be the consistency of unwhipped heavy cream. If it’s too thick, add a little water. Cover, and let sit for at least half an hour. To fry…melt a pat of butter in a large frying pan over medium heat. When it’s just starting to brown, put about 1/3 – 1/2 cup of batter in, and swirl the pan around till you have a thin circle of batter. I like to use a pan that’s bigger than the crepes I’m going to make, so that I have room to flip them, and so the edges get nice and crispy. When the top of the crepe seems to have dried out, and has little holes forming in it, slide a spatula under the side and take a peek at the bottom, if it’s brown, flip the crepe. The second side only needs to cook for about 1 minute, the top will puff slightly. Remove to a plate, and fry all the other crepes in the same fashion. cut the mushrooms into chunky pieces. Put in the food processor with the shallot and herbs, and process very briefly till the mushrooms are finely chopped but not pureed. It doesn’t need to be completely even – variation will just give the mushrooms nice texture. Drizzle olive oil over and mix well. Spread evenly on a baking sheet. Bake in the oven for about 15-20 minutes. Stir frequently. The mushrooms go through a few stages while they cook. They’ll release their juices, and then they’ll dry up again, and eventually get crispy and caramelized. This is what we’re going for! You don’t want them to be black and charred, but don’t be afraid to let them get quite dark brown. They’ll reduce a lot, too, you might end up with about a cup. In a large skillet over medium heat, warm the olive oil. Add the garlic and herbs, stir and fry for half a minute. Add the spinach and a few spoonfuls of water and sautée until tender and bright, about five minutes. In a tart pan or on a baking sheet (lightly buttered) place one crepe. Spread a layer of romesco sauce evenly across. Place another crepe on top. Spread a layer of mushrooms across the top. Place another crepe on top of that. Spread a layer of spinach. Place another crepe, spread a layer of ricotta. Keep repeating till you’re out of crepes or out of filling. You can go in any order you like, and make any kind of combination of elements you like. 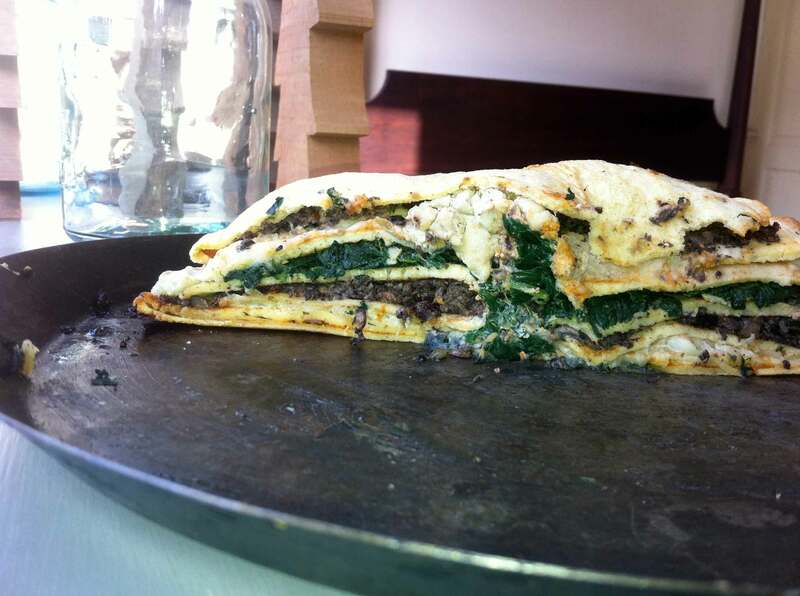 This entry was posted in basic pie filling, recipe, Uncategorized and tagged crepe stack, crepes, layered bake, roasted mushrooms, romesco by Claire. Bookmark the permalink.